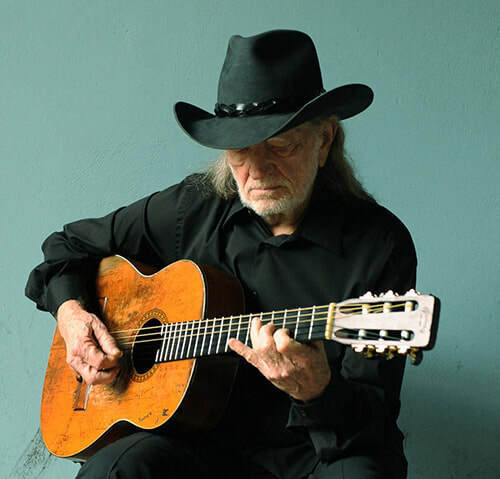 With a six-decade career and 200-plus albums, 85-year-old Texan Willie Nelson & Family will headline The E Center at the Edgewater on Friday, Oct. 12 at 8 p.m. Tickets start at $45. Nelson, who has earned every conceivable award as a musician and singer, has delivered more than 10 new albums in recent years. His newest album of Frank Sinatra tunes, called “My Way,” just came out. The incredibly talented and prolific Nelson also has credentials as an actor, activist and author. His latest Top 10 New York Times best-seller book is “Pretty Paper,” a Christmas novel co-written with David Ritz. The book presents a fictional account about the life of the street vendor who inspired the song of the same name. 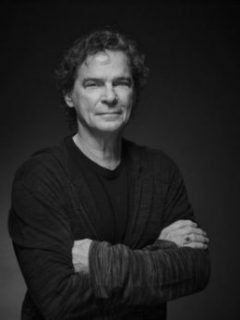 The five-time Grammy and two-time Dove Award winner BJ Thomas will appear at the Riverside in Don’s Celebrity Theatre Oct. 18-20 at 8 p.m. Tickets are $35. Thomas has sold more than 70 million records and is ranked in Billboard’s Top 50 most played artists over the past 50 years. He is particularly known for his hit songs of the 1960s and 1970s, which appeared on the pop, country and Christian music charts. His best-known recordings are the Burt Bacharach/Hal David song “Raindrops Keep Fallin’ on My Head,” the original version of the Mark James song “Hooked on a Feeling” and “(Hey Won’t You Play) Another Somebody Done Somebody Wrong Song.” “The Living Room Sessions” album in 2013 was his debut recording for Wrinkled Records, featuring intimate acoustic re-imaginings of 12 of his most renowned songs. British rock singer and songwriter Rod Stewart will embrace the outdoor stage at the Laughlin Event Center on Saturday, Oct. 20 at 8 p.m. Tickets start at $60. The two-time Rock and Roll Hall of Fame inductee passed his 50th anniversary as a recording artist. He is one of the best-selling music artists of all time, having sold more than 200 million albums worldwide. 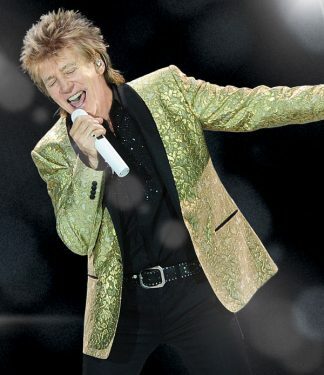 The 73-year-old singer born and raised in London, has had six consecutive No. 1 albums in the United Kingdom. Continuing his creativity, Stewart’s 29th solo studio album, “Another Country,” picked up where his 2013 globally acclaimed album “Time” left off, which marked a 20-year dry spell in songwriting for the superstar. He credits his best-selling autobiography “Rod” for sparking his current music creations. The 7th annual Laughlin International Film Festival will be held Thursday-Sunday, Oct. 4-7 at the Stadium 9 Cinemas, Laughlin Outlet Center, and Tropicana. The event will be highlighted by social networking events, film workshops and panels, parties and an awards show. Other events taking place will involve horsepower beginning with the 3rd Annual Method Race Wheels Laughlin Desert Classic presented by Polaris Oct. 11-14 at Laughlin Events Park. Thursday events will include The Parade of Champions down Casino Drive, time trials, welcome party, and the UTV Night Race. Registration and drivers meeting will be Friday at the Tropicana, and Tech and Contingency at a location TBD. Saturday and Sunday will be devoted to two days of racing. This is Part 10 of a series. Read Part 1 (Searchlight), Part 2 (Cal-Nev-Ari), Part 3 (Laughlin), Part 4 (Laughlin), Part 5 (Laughlin), Part 6 (Laughlin), Part 7, Part 8 (Laughlin), and Part 9 (Laughlin). I am asked, a lot, for recommendations on where to stay, what to bring, when to go, and other suggestions to make a trip to Laughlin more enjoyable. I usually don’t mention which rooms or floors you should stay in at the hotels. Each room on each floor can be different. It all depends on the time of year, holiday, weekend, events in town, housekeeping, and if the management has started remodeling portions of their hotel. I can, however, mention a few tips for all rooms in all hotels and, you will notice, some of them can be used wherever you travel, not just to Laughlin. 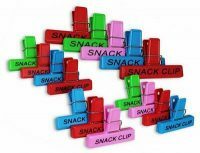 • Bring either snack/potato chip bag clips or office supply large binder clips to close the window curtains in your room to keep out the sun and heat. I usually attach 3-4 of them after closing the curtains. Curtains have been pulled and tugged on so much that they rarely stay completely closed unless they are brand new. But, what a difference in the a.m. in the summer in Laughlin! 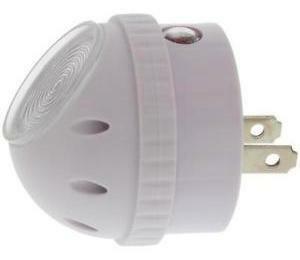 • Buy and bring a couple of cheap $3 swivel nightlights with you to put in either the bathroom or the room. (I’ve picked them up at Home Depot, Lowe’s and Wal-Mart.) Sometimes there is a nightlight on the hair dryer in the bathroom, so, you might not need one there. I always have one in my cosmetic bag and plug it in the bathroom as soon as I unload my bag. And I remove it each morning when I turn on the light to get ready for the day. This way I don’t forget it … again! • Most Laughlin hotels now have Keurig coffee makers in the rooms. So, if you use Keurig at home you should bring some pods with you since most of the rooms will offer only two pods per day. Also, I would recommend running a couple of cups of plain water through the Keurig before you put in your pod, just for sanitizing! And if you bring water bottles into your room from the casino, they are the best water to use in your Keurig, instead of the hotel sink water that has no filtration. Your coffee will taste better! • When you get into your room check the clock on the nightstand. Make sure that the alarm was not set and turned to the ‘on’ position. Otherwise, you could be in for a rude awakening at the wrong time during the night or day. And being in a strange room, you will be fumbling for the light and switch to turn it off. Resolve the possible problem before you even unpack. 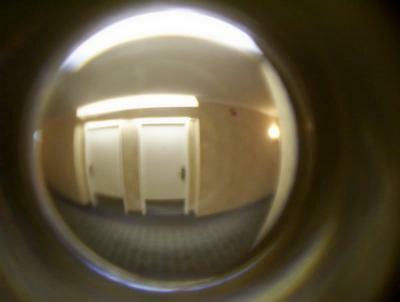 • Check the peephole on your room door to make sure you can see out, but other people can’t see in. This is for security’s sake. If you can’t see out it means they can see in and you should contact security to have them reverse the peephole. This is not an unusual request, although it is pretty rare. • Lock your hotel door. Yes, the door is heavy and when you turn the lock you are, in effect, locked in. But housekeeping, security, management, and even guests that are given the incorrect room access can still enter your room. If your door has a separate security latch above the lock make sure you close and secure that bar too. This will prevent total entry into your room. • All hotels have security boxes or safety deposit boxes free of charge. Some hotels might also have safes in some of their hotel rooms. Most will have the boxes at the front desk/reservation area. Just ask when you check in. If you have valuables and there is no safe in the room, and you do not want to use the safes/boxes behind the front desk area, make sure you put your valuables in your luggage and lock it! Do not leave anything out that is of value. If you leave money out the housekeepers will think it’s a tip. It doesn’t matter if it is $3 or $20. I know you try to trust your housekeeper not to take anything as I do, but, there have been times when I have walked down a hallway and seen the doorway wide open to a room with a housekeeping cart in front of the area, and the housekeeper was going down the hall to pick up something or talk with another housekeeper. It would be so easy for anyone to walk in at that point. Burglaries happen in minutes. • All hotels will charge a per-day fee of $50-$100 for what they term incidentals. It covers a portion of the prices you pay for pay-per-view movies and is a security deposit, so-to-speak, for damages you might make to the room. This is basically a hold on your credit card, and, since it is a charge for each day, your credit card company could be holding $400 that you will not be able to use for other purchases while on vacation. Keep this in mind when you book your reservations so you are not short even more money than you planned for on for your trip! The good news is the daily hold is released when you check out, so you are not losing your money. It’s just unavailable for use during your trip. • Although Nevada has passed marijuana laws, there is no marijuana usage allowed in public areas. Report the smell of marijuana to Security if you smell it down the hallway from your room. You should not be smelling it on a non-smoking floor, anyway. Some hotels are turning a blind eye to the use, saying there is nothing they can do because it is legal. This is both true and incorrect. Marijuana is legal to purchase and use in the privacy of one’s home. It is not allowed in public places. It is banned in casinos and the hotels attached to them. The police can issue citations of up to $600 for use of marijuana in a public place. This is why the dispensaries are pushing for marijuana/pot lounges in the State of Nevada, which might be approved in 2021. • If you run into any problem with your room or anything inside the facility be sure to either call or go down to the front desk and speak with the manager. I have found that the general manager of the property has the final say to fix a problem. Most of all, keep a positive attitude. You are on vacation. Think that this could be the last time you go on a vacation and enjoy yourself, instead of getting into the small details. Yes, you might be inconvenienced by something unexpected happening, but look at it as an adventure instead of letting it ruin your trip. The majority of your trip will be fun and relaxing if you keep your frown upside down. Okay, those are just a few tips regarding your rooms. Just remember that each room on the same floor could have a different housekeeper. If you read a ‘review’ by someone who didn’t like their room at a certain hotel take it with a grain of salt. People would not be flocking by the thousands to vacation if every room was bad in a hotel. You are reading reviews from a very small percentage of travelers. 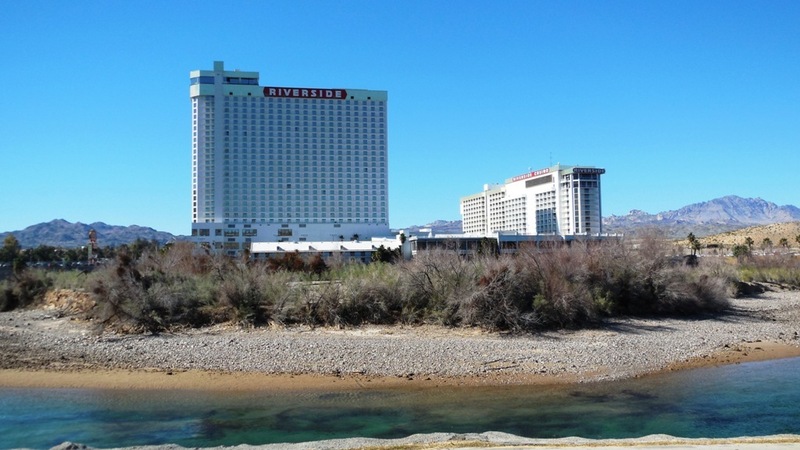 • Riverside Hotel – As of May 15th, they charge a $10 per night resort fee for Retail & Bronze level players card (King Club) members. For all other player card categories the resort fee is waived. Their fee includes basic Wi-fi (in room) for 2 devices, a refrigerator, coffee (in room), fitness center, pool and local and 1-800 phone calls. • Aquarius – They are now charging a resort fee of $10 (plus tax) per night. The fee includes 2 bottles of water at check-in, entrance to their pool & fitness center, in addition to unlimited local and 800 calls. If you earn 300 base points on your players card (ace/Play) you will receive $10 in free play or a $10 bet coupon. • Tropicana – They began charging a Resort Fee as of July 1st. • Pioneer – The casino portion of the property is open, as of 8/30/18, and the remodeling of their hotel rooms has begun. 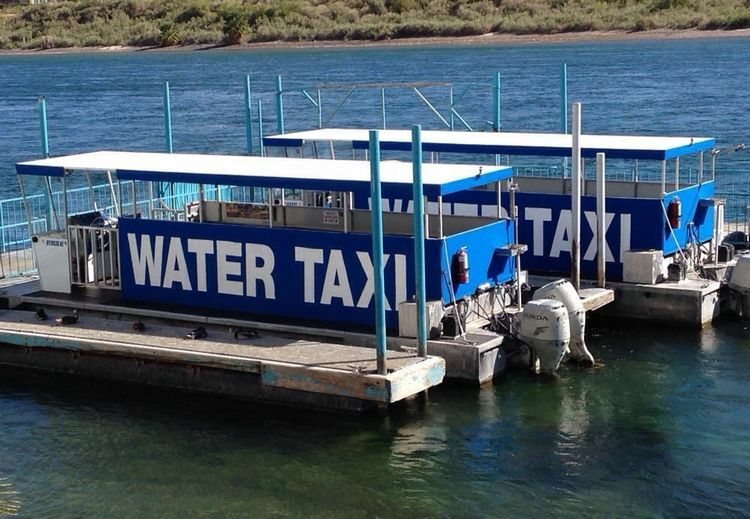 Throughout my travels at the hotels I have failed to mention the water taxi mode of transport in Laughlin. There are several water taxis that go back and forth from hotel to hotel (except the AVI) and also stop at The Regency Casino for $5 per ride (1 way) or $20 per day (unlimited rides) per person. This is the best way to travel from any of the hotels if you want to go to or leave from Harrah’s Hotel & Casino at the top of the hill. You should try this at least once while you visit Laughlin. It is amazing to see the captain maneuver the taxi to the dock with the swift current of the Colorado River. And, make no mistake, this is a real captain who is fully licensed by the U.S. Coast Guard. 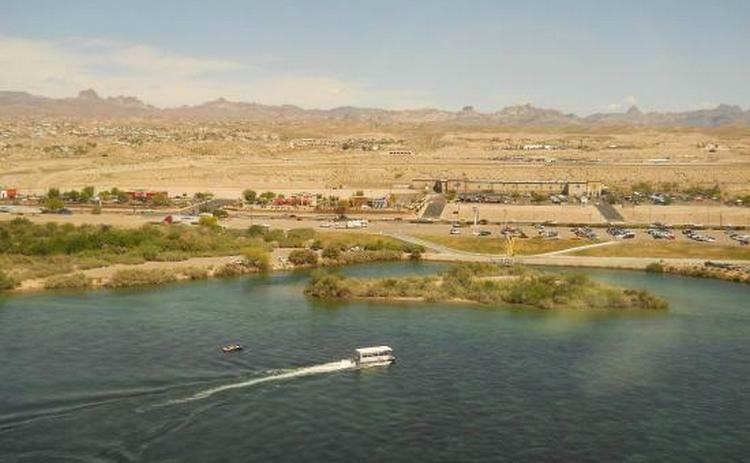 Besides the water taxi’s that ply the river between the hotels, the Riverside Hotel & Casino also has a separate water taxi that goes from their dock across the river to the Bullhead City, Arizona side of the river. This is used for anyone parking in their Arizona lot and is a free service. It is used by employees, semi-truck drivers or any visitor since there is ample free parking. You will also see employees or residents dropped off by water taxi’s in the parking lot by the stairs that go down to the dock. You might want to ride it one time back and forth without getting off, just to get a different experience for free! Depending on the time of year you are visiting, the water taxis might not be running. At certain times of the day, early morning and late evening, the water levels are too low on the river for them to operate. During winter months, when the weather is a factor or business is slow, they might be closed for days or even change their hours. Their general daily operating hours are 9 a.m. until 10 p.m. during the Summer and until 9 p.m. during the winter. It is best to ask the captain their hours before you board, so you know their last departure time to return to your hotel. Tickets can be purchased at any dock. They also have an information center located on the bottom floor of the Golden Nugget Hotel & Casino, where you can purchase tickets and get more information.